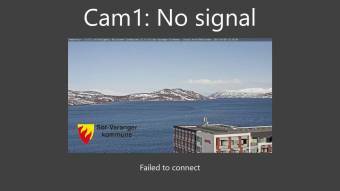 It's 07:01 in Kirkenes, Norway right now. View onto the Bøkfjord A nice livestream from Kirkenes over the Bøkfjord. Kirkenes: Panorama onto Kirkenes, 0 miles away. Kirkenes: Kirkenes Center, 0 miles away. Kirkenes: E6 Kirkenes South, 0 miles away. MS Trollfjord: View from Board, 22.3 miles away. MS Trollfjord: View from Onboard, 22.3 miles away. Vadsø: Port of Vadsø, 25.1 miles away. Vadsø: Vadsø Torg, 25.1 miles away. Vadsø: 360° City Panorama, 25.1 miles away.